Safety Steel Work Platforms Turn Your Forklift Into An Aerial Work Platform Lift! • Model ER-1203B 3′ x 3′ Platform 205 lbs. • Model ER-1244B 4′ x 4′ Platform 320 lbs. The job is done quicker because staff work in the safety of a full guard rail structure. Both hands are free to complete the job at hand. 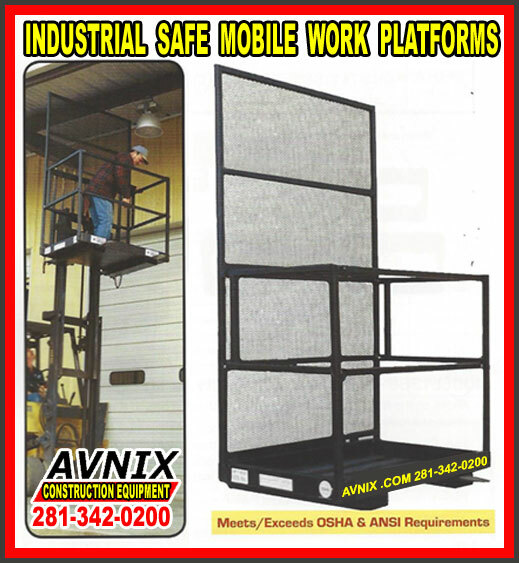 Avnix work platforms are quicker and safer than ladders. No lost time installing scaffolding. No need spend thousands of dollars in other tools. Your forklift and an economical Avnix Work Platform can do the job right. Stop staff from standing on a pallet or improvised platform. Our Work Platforms are safe and meet or exceed all OSHA / ANSI requirements.